Whatever happened to AP II? As international humanitarian lawyers well know, “AP II” refers to Protocol II Additional to the Geneva Conventions of 12 August 1949, and relating to the Protection of Victims of Non-International Armed Conflicts, a treaty that clarifies legal rules in conflicts that present something other than the classic country v. country scenario. Put another way, AP II is the treaty that details the laws of today’s wars. It enjoys 167 parties. The United States is one of 3 countries (the others are Iran and Pakistan) that signed on December 12, 1977, but never ratified. The treaty mentioned is AP II: according to State’s current list of treaties pending in the Senate, Reagan submitted it to that upper house of Congress on January 29, 1987. Yet today, more than a quarter-century later, and four years after the promised “consolation,” AP II remains in the Senate’s dustbin. AP II is No. 10 on a list of 37 treaties, a list that includes some treaties about which I posted here. The most recent was submitted earlier this year, the oldest, ‘way back in 1949. 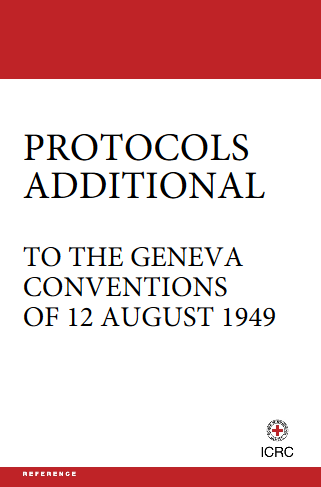 AP II’s sibling, Protocol I Additional to the Geneva Conventions of 12 August 1949, and relating to the Protection of Victims of International Armed Conflicts, is not pending at all. (It has 173 states parties, and the same 3 state signatories.) (image credit) Villanova Law Professor John F. Murphy’s chapter in a 2012 book indicates that the March 2011 fact sheet said only that the White House intended to apply the first protocol’s fair-trial provisions (provisions that a plurality of the Supreme Court deemed “indisputably part of the customary international law” in Part IV-D-iv of Hamdan v. Rumsfeld (2006)) – not that the White House wished to submit that treaty as a whole.